Manager Jose Mourinho walked to Old Trafford before Manchester United's Champions League game with Juventus as their bus again got stuck in traffic. United were fined £15,000 (£13,203) by Uefa after last month's match with Valencia kicked off five minutes late. This time the team stayed at a hotel half a mile away from the ground, but the bus journey took 45 minutes. "I walked with a hoodie in the middle of the fans and nobody recognised me," said Mourinho. "It took two minutes." The Portuguese, who had been warned by Uefa over the late kick-off, told BT Sport: "The players were on the bus for 45 minutes. But Juventus had the same kind of problem. We don't want to be punished again." Despite their late arrival on Tuesday night, the game kicked off on time. 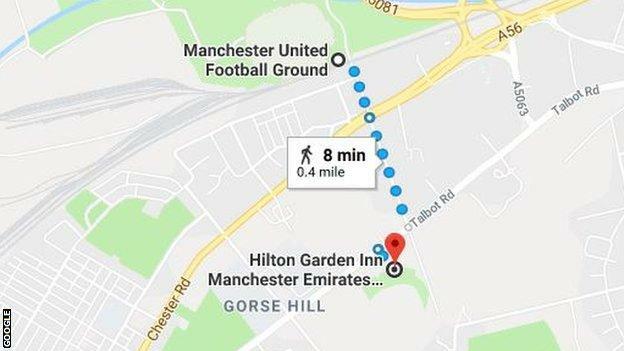 United usually stay at the Lowry Hotel in Salford, 2.5 miles away from Old Trafford. 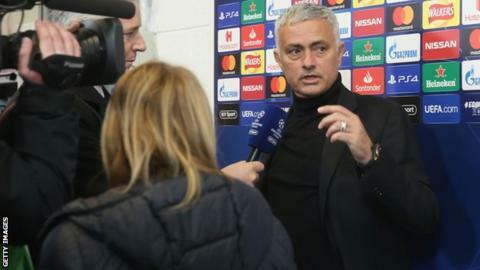 But Mourinho said the team "changed hotel" and were "just around the corner", at the Hilton Garden Inn in Stretford, located at Lancashire's Emirates Old Trafford cricket ground.